MADRID, Dec 20 2017 (IPS) - If you are in Madrid and have some spare time, just go to an area which residents consider a “high class” neighbourhood situated in a district bordering Barrio de Salamanca, one of the richest areas in the Spanish capital. There you will see relatively modern buildings next to old houses constructed under Francisco Franco’s rule (1939-1975) and sold to military officials at token prices. You will also see many shops run by Chinese migrants, selling cheap but nice cloth in what used to be boutiques frequented by wealthy middle-aged women. 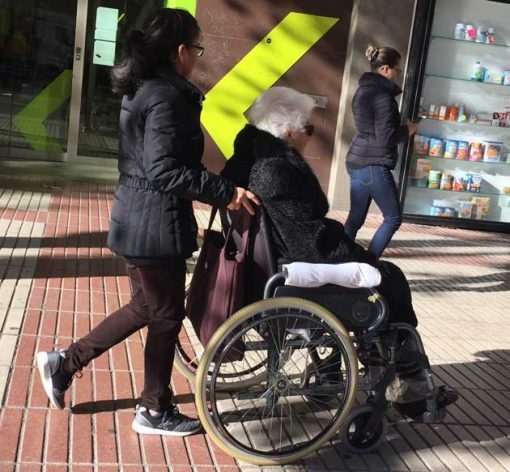 But what you will often see are old Spanish men and women, some of them in wheelchairs, who are patiently accompanied and taken care of by Latin American migrants, going for a walk, sitting in a small park to breath some fresh air and take the sun. Before that, these very same migrants would have walked the dogs of the elderly persons for whom they work, went shopping for food, read books or newspapers to them, and helped them wash their faces before dressing them up to go out. Back home, the accompanying migrants will clean the house, wash, iron, cook, give them their medicine, answer the phone calls of their very busy, very short of time working sons and daughters. “They are good people, all old people are good people,” Nancy*, a 33-year old Ecuadorian migrant, told IPS. “It is a tough job because they [the elderly] spend their time either complaining or saying confused words or speaking to their late husbands or wives,” she tells IPS. In spite of that and of some prejudices against migrants in general, such as “they come to Spain to take our jobs” or “to cheat our elderly people and take their money,” Nancy* does not complain. Nancy* gets 620 euro a month (some 700 dollars) helping her pay her rent and send a little money to her own elderly parents in Ecuador. She is now looking for two part-time jobs to earn a bit more. Vladomiro* (37) is Colombian and assists don Jaime, an 87-year-old man who did well running a small grocery. Like Nancy*, Vladimiro* feels compassion. 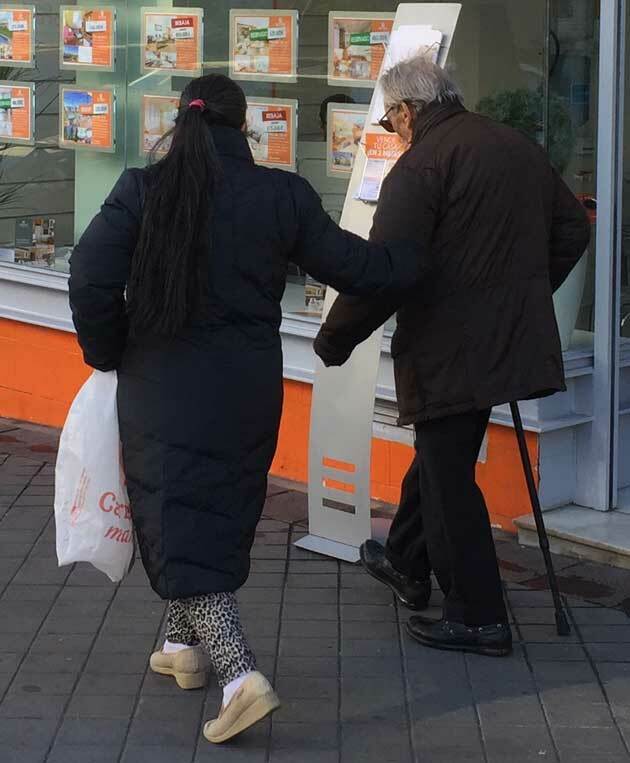 “In our country we all respect elderly people… they have worked hard all their lives, they built up their families and did all what they could for their daughters and sons to have studies and a better future that what they had,” Vladomiro tells IPS. Both Nancy* and Vladomiro* confess to feeling homesick for their families, their countries, their food, their habits and traditions. But they are relieved as they can send some money to their families and help their sons and daughters have a better life. By the way, this neighbourhood full of elderly people accompanied by Latin American migrants is called Barrio de Hispanoamérica and its streets all bear the names of Latin American countries and capital cities. If you instead go to the popular Malasaña neighbourhood, you will see many ethnic restaurants run by Latin American migrants, serving traditional dishes though moderating the taste to adapt it to the Spanish clientele’s eating habits. Jose* is a 39-year Peruvian. He works as waiter and partner at a small restaurant. His wife Alicia (35), also from Peru, works in the kitchen. He tells IPS that they met in Madrid and married here, and do not want to have children for now as they’re working hard to save money that can allow them both help their parents and also one day return to their country to have a “decent” life. Jose* is proud as they managed to resist the temptation of buying a flat in Madrid’s outskirts, like other migrants did a decade ago or so. It was a time of prosperity due to a spectacular construction boom. Developers were offering jobs to thousands of people, many of them migrants, in a singular marathon to build high-rise blocs, paying up to 3,000 euro (some 3,500 dollars) to even unskilled bricklayers, without even questioning if those migrants had legal residency permits. During that boom, banks immediately rushed to offer easy, fast, attractive credit to everybody, migrants included, to buy property, furniture and cars. “Many migrants did,” says to IPS Dominican Danny* (45) who was visiting his friend Jose*. Then came the 2008 global financial crisis. “The workers lost their jobs, they could not pay their monthly instalment, the banks sued them, the judges ordered their eviction, and they lost all the money they had paid to the banks, apart from their flats, furniture and cars,” he explains. The result is that hundreds of them found themselves on the street and had to return to their countries of origin, almost empty-handed. In fact, recent data published by the Spanish National Institute of Statistics (Instituto Nacional de Estadística—INE) reveals that a growing number of Latin Americans have been returning to their countries. In Spain, it is estimated that there are some 1.8 million Latin American immigrants, with Colombians, Argentinians, Bolivians and Peruvians representing the main groups, with an increasing number of Andean people residing in this country. On average, they transfer around 15 per cent of their annual income to their countries of origin, especially in the case of Ecuadorians and Colombians. In the Andean region, migrants’ remittances amounted to 9,200 million dollars in 2006, according to the Andean Community. Colombia is the country with the largest remittances received with 3,890 million dollars in 2006; followed by Ecuador, with 2,916 million dollars; Peru, with 1,825 million dollars; and Bolivia, with 569 million dollars. Data related to the first quarter of 2017 confirms that Latin American immigrants in Spain have been sending about 15 per cent of their annual income to their countries of origin, with an average close to 270 euros per month. But the fact that migrants are returning does not put an end to migration challenges. “Rather than being viewed as an isolated phenomenon, return migration is an integral part of international migration,” UN International Organization for Migration (IOM) senior Migration specialist Ana Fonseca had explained in a related event in Ecuador. Meanwhile, the Spanish statistics agency INE estimates the number of Spanish citizens residing abroad has reached 2,406,611 as of January 1, 2017, evidencing an increase of 4.4 per cent (101,581 people) with respect to data for the same period of the previous year. An IOM 2015 report showed that since the beginning of 2010, more Spanish citizens emigrated to Latin America than Latin Americans who do the opposite. As for the countries of destination, the UK received 13,281 Spanish more than in 2015, followed by the US (11,675), France (10,889), Argentina (8,814), Germany (8,656), Mexico (7,643), Cuba (6,136), Ecuador (4,107), Colombia (2,835) and the Dominican Republic (2,095). Perhaps many Spanish unemployed people are not aware of this study—otherwise they would not be blaming migrants but rather their own government and rich corporations for the lack of jobs. *Names of migrants have been changed to protect their identities. Amazing that no one considers the refugee migrant of Bethlehem, of his human right to migration. Imagine if Egypt had returned the little jesus family back to herod? No Christianity ! therefore anti migration is ANTI-Christ?? Oy Veh!